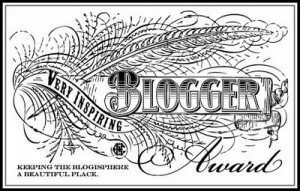 Very Inspiring Blogger Award, thanks Bette! This blog was nominated on April 25, 2013 by Bette A. Stevens, Children’s Author, for the Very Inspiring Blogger Award. First of all, I would like to thank Bette A. Stevens of the blog 4writersandreaders for this gracious nomination. Please, check out her awesome literary blog. 1. Where did visitors to my blog come from today, so far? 2. Where did visitors to my blog come from this week? 3. Which posts on my blog were most popular this week? 6. Which Gravatars were clicked most on my blog? 7. Which English Wikipedia articles were clicked most on my blog? Thank you, and best wishes for you and your blog! Hi there…well…I am embarrassed! Have been going around checking that all the dots are dotted and checking things twice…and noted that I never completed the prestigous Very inspiring Blogger Award criteria!! Last year was pretty much taken up with healing from the coronary artery bypass…but I survived and am back in the saddle here!! Question about posting the award on the site…I linked it back to the link that you had sent to me which links to the Versatile Blogger page here…is that OK? Should I link it to your site at Dear Kitty 1 instead? If you could be so kind to go to http://www.thelindenchronicals.com and check on the right side underneath the “gallery” to make sure that is where you want the link, I would appreciate it!! Meanwhile, I will get to work on the blog post and choose 15 worthy bloggers to also award. Can I award you back? Oh…also, I don’t know if your name is really Dear Kitty…but would like to use your actual name when posting if that is OK…just let me know what that is and the other links that you would like me to add. Thanks so much and so sorry for the extended time it has taken me to respond!! Take care! (Also, I don’t know how to do the pingback if you could give me a pointer.) Thanks! You can use the name petrel41. About pingbacks: in principle I think they should be automatical, if the other site to which you link has no moderation for one’s comments.